Steel garage doors are the most popular. 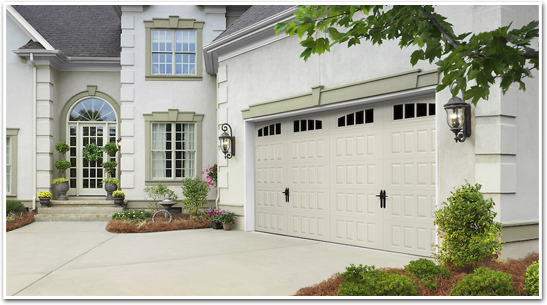 Steel is the most widely used material for garage doors today because of its durability and economy. Steel will look great forever and is just about maintenance-free. Additionally, they have the advantage of being the least expensive garage door you can buy. 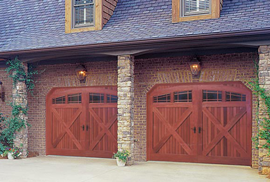 Radically beautify your home with wood carriage house doors. These doors increase the curb appeal of your home so much that real estate studies have shown they increase the value of your house. 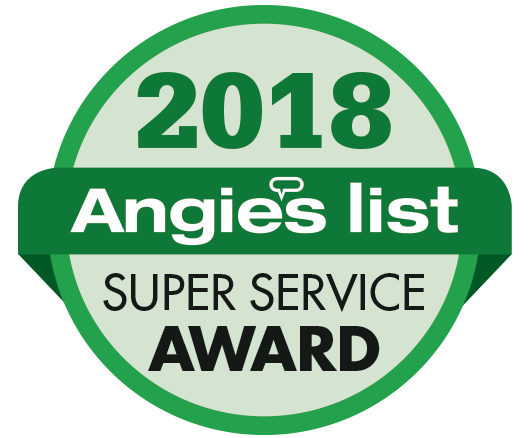 But that's not the real reason to have them... the most important reason is just how much you'll love the way the exterior of your home looks... and if the neighbors are a little jealous, well, that just can't be helped! Custom Garage Doors are available in any size and Precision will be happy to work with your architect. Wood composite doors come primed and painted with a limited lifetime warranty. This environmentally friendly door is made mostly from recycled material and is crack-proof, split-proof and quiet. This door is insulated and the wood grain is properly registered so that the door has the elegance of wood. Once the wood-composite door is painted, it requires a minimum amount of maintenance. Wood composite garage doors are an excellent choice when you want your garage door paint color to match your home, window shutters, etc. Vinyl garage doors are maintenance free. They are scratch resilient and will not dent, rust or crack. They are insulated and work quietly. The wood grain is properly registered so the door has the appearance of wood. A vinyl door is available in four colors and never needs repainting. On occasion, vinyl doors are not always readily available. They may need to be ordered from the factory. 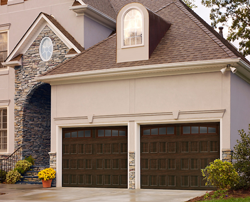 Specialty garage doors are available in Glass, Fiberglass & Bronze. 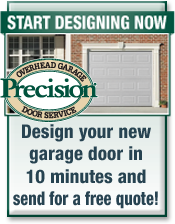 If you are interested in specialty garage doors, please give us a call and we'll get you a free quote. The key to finding the right garage door, the one that you'll still be happy about years from now, is finding the door with color and style that you like most. It should match nicely and accent the facade of your home. The number of colors, styles and window options are nearly endless, so we created an easy step by step designer that allows you to try all the different combinations. The garage door designer allows you to quickly evaluate all the colors, panels and window options available to you. Pick the ones you want and send for a free price quote. Click here to start designing. Carries all necessary insurance; don't hire without insurance including workmen's comp. You're risking your financial well-being. 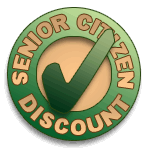 Provides warranties on both materials and labor of your garage door. Has uniformed technicians in clean trucks with their logo painted on the side. Fly-by-night companies need to change their name every few months and so will not invest in these things. 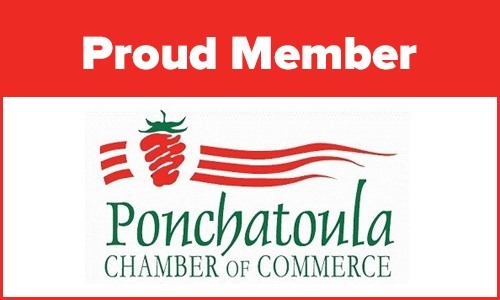 Is courteous and professional looking and acting. Will supply references from previous customers when asked. 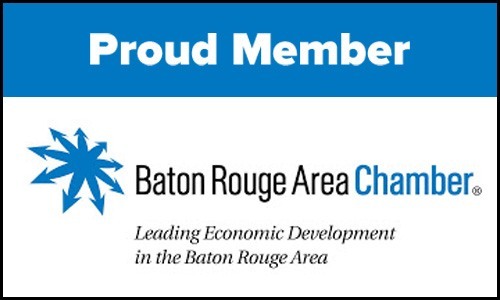 Is a member of The Better Business Bureau & International Door Association (IDA). Choose a company that provides training for their technicians. The best way to avoid problems is to never have them and proper training goes a long way. Every year, there are more accidents related to garage doors than to lawn mowers and snow blowers combined. You can avoid future garage door accidents when the technician is properly trained in safety procedures. Warranty – How Well Do I Understand It? Nearly every garage door comes with a warranty of some kind. Many companies claim they have a lifetime warranty but don't really cover everything. Garage doors have lots of parts: rollers, cables, springs, door panels, etc. Make sure the warranty covers those parts. When you read the fine print, you may also find that the warranty does not cover warping, splitting, cracking, denting, or rusting. It also may limit parts to one year. When shopping you want to make sure you are comparing apples to apples.